The J/109 has proven herself to be well suited for sailing in Irish waters for several years, achieving major successes in the main offshore races and championships allied to starring roles in top regattas. Yet it is only now that the class seems to be taking full account of the fact that it has the potential to be Ireland’s premier one design class, in the stellar tradition of a golden thread going back through the Dublin Bay 24s, the Belfast Lough 25s, and the Cork Harbour ODs. W M Nixon takes a look at a very likeable boat. It has taken the J/109 a dozen years to become an overnight success in Dublin Bay. For it was back in 2004 or thereabouts when George Sisk appeared with the first one, fresh out of the package. But as the next one, also brand new, was brought in by James and Sheila Tyrrell whose loyalty to their Arklow base is unshakeable, the Sisk initiative towards a possible class in Dun Laoghaire remained a matter of ploughing a lonely furrow. Yet very soon George and his veteran shipmates discovered that the business of sailing a new boat with a masthead assymetrical flying from a rather long retractable bowsprit was a much more manageable challenge than had at first seemed the case. So as the Sisk equipe were more accustomed to racing boats in the 40ft-plus size range, they were soon seduced by the well-organised J/Boats product range and production line into moving up to a J/133. Yet others around Dublin Bay and adjacent ports continued to dream of the J/109 as being ideal for the area, including Afloat Magazine and Afloat.ie, where we were pushing the idea from the moment this writer saw the Tyrell family’s Aquelina emerging at the head of the fleet in the Lambay Race of 2004, or maybe it was 2006, for on both occasions they went straight on to do the Dun Laoghaire to Dingle Race the following day. Whatever the year, we were smitten by the entire combination of functional good looks, manageable size, fantastic yet seemingly effortless performance, good cockpit ergonomics, and excellent accommodation. In other words, what’s not to like about the J/109? Although the production of new boats is winding down - for the well-run J/Boats organisation well knows that even the very best things must one day come to an end - the J/109 is probably the world’s most successful 36ft class, sailed as a one design in ten countries, and much loved for club, regatta and offshore racing, and fast cruising too. Her success will continue for decades, for J/Boat-built craft last well, and almost all the range continue to have timeless good looks. They call the J/109 a racer-cruiser, and when we take a look at that accommodation layout, we realise that here is a sensible and liveable arrangement with which a fortnight’s good cruising is a perfectly feasible proposition. Of course her motion would tend to be livelier than a boat with heavier displacement, and you’d need to look at the option of an additional but removable bladder tank to carry extra fresh water. But as most of the boats have a heater and other comforts, the cruising option is not just an empty salesman’s claim. That very experienced sailor Brian Mathews, who a week ago brought former SB 20 sailor Andrew Algeo’s recently-acquired J/109 back to Dublin Bay from St Malo in north Brittany, is very much a fan of the J/109. “She’s just such a complete and successful concept” he says. “In fact, the only change of any significance I’d suggest is that you fit a little hatchway into the fore-and-aft bulkhead on the starboard side of the engine to enable easy access from the toilet compartment to change the oil filter on the aft side of the engine. Other than that, she’s spot on”. The great thing is that you can buy this race-winning boat off the shelf, so to speak. She’s completely normal and seamanlike in appearance without any distortions in her hull shape to take advantage of some temporary quirk in the measurement rules, she has proper accommodation, and yet you can go out and win in open handicap racing against a whole fleet of fancy hull-distorted stripped-out racing machines. And sailing her is such a joy. It’s about 450 nautical miles from St Malo to Dun Laoghaire, and Brian Matthews and his crew saw it off in 52 hours. That included a four hour pit stop in Newlyn, so they averaged better than 9.3 knots. They’d north’easterlies with fog in the English Channel, but that didn’t stop them from logging a speed burst of 18-knots-plus when the wind gusted to 38 knots. And the stop in Newlyn allowed the wind to back to the southeast which blew them home in comfortable time for pints in Dun Laoghaire last Friday night, and never a bother out of the boat the whole way. Yet long before the current wave of new arrivals which holds out the real possibility of a class of between 15 and 20 boats in Dublin Bay by next season, other pioneers have been quietly preaching the J/109 gospel simply by having one of the boats, obviously enjoying sailing them, and doing well while they’re at it. We’ve had people like John Hall, Declan Hayes, John Maybury and several others in Dublin Bay, Ian Nagle in Cork, Glen Cahilll in Galway Bay, and more recently the Shanahan family in Dublin Bay. The Fingal Flyer. Pat Kelly’s J/109 Storm from Rush Sailing Club has been a major force in Irish sailing since 2008. The Kelly family from Rush is a force of nature. Aboard their boat Storm, Pat is crewed by his five sons, while his background in sailing is deep and broad. Like everyone in Rush he was into Mermaids, but being in the orbit of the legendary Peter Dunne, GP 14s might also be on the menu. Then his first keelboat was a Shipman 28 which he had for twelve years, following which he’d a Puppeteer 32 and then a First 30, all of which had mooring near his home at the Rogerstown Estuary. But increasingly he also used the marina at Howth, and the new J/109 Storm has remained almost totally Howth-based, but everybody quite rightly thinks of her as the J/109 from Rush. To campaign a J/109 seriously, you need to think in terms of a crew panel pushing towards 15, and the Kelly clan of Pat, David, Ronan, Paul, Paddy and Pat’s grandson David also make adopted brothers of Kevin Sheridan, Mark Ferguson, Alan Ruigrok, Sean Murphy, Marty O’Leary and Joss in order to keep the Storm show on the road. But like many lively sailing families they like to add to the complications with extra boats, and David Kelly is in partnership with Pat Boardman on the classic Half Tonner King One, which drew a considerable Rush presence to Falmouth for the Worlds in August, while David Jnr is also in the national Laser Radial squad. They play hard, they work hard, and Storm worked extra hard in 2016 as she was chartered to Dave Cullen to race as Euro Car Parks in the Volvo Round Ireland race in June, in which she was the only Irish class winner. In an exceptionally busy season, the Kellys were winning here there and everywhere (they’ve been ICRA Boat of the Year in times past), but it all reached a new peak with the J/109 Nationals 2016 in the first weekend of October, hosted by the Royal Irish YC in Dun Laoghaire. It also marked a new peak for the J/109 class in Dublin Bay, as the fleet has seen the addition of some of the more noted Dun Laoghaire sailing families in recent years. Of course, the Shanahan clan from the National have been on the J/109 strength since 2009, and have carried off such trophies as the ISORA championship and the Dun Laoghaire to Dingle win overall, as well as a very close second overall in the Round Ireland race. But through 2016 class newcomers with Dun Laoghaire sailing links which come down through the generations joined the J/109 fleet, including the legendary Tim Goodbody from the Sigma 33s, and Andrew Craig from the Dragons. Thus it may well be that what was holding the J/109s back from acquiring the critical mass of an independent class in Dublin Bay was the simple fact that these top stars felt they still had more to get from the boats and classes they were already involved with. But once they’d made the decision that the time was ripe to join the J/109s, a threshold was crossed. For what these people who were pure One Design in outlook discovered was that in Dublin Bay, the J/109s didn’t necessarily see themselves as a One Design class. Under DBSC rules, the class divisions are made on IRC Rating, and this meant that while most J/109s were in Class 1, a few were up in Class 0. As well, the fierce loyalty to Dublin Bay SC meant the J/109s were reluctant to even think of, let alone push for, a separate identity as a class of their own, as it would leave Class 1 with just a pitiful handful of boats. And anyway, some J/109 crews actually get extra enjoyment out of racing within a disparate group rather than on a purely boat-for-boat basis. Thus this high profile and hard-raced J/109 Nationals 2016 may well have high-lighted the J/109s’ potential to became Dublin Bay’s premier One Design Class, but it also brought into focus the problems inherent in doing so. Before it even got under way, the Class’s majority wish to have a strong Corinthian ethos – even though championship rules permitted professional sailors – resulted in the boat which should have been the defending champion not racing in the Nationals, as that boat had been wont, in major events, to use the services of a top professional sailor, though not in a helming capacity. It’s an issue which it’s hoped will be resolved at the AGM in January, with the feeling being that the majority will favour the Class National Championship in Ireland being a totally Corinthian event. But meanwhile as the Nationals drew nearer, Class Captain David Stewart (a non-owner, he crews on Ronan Harris’s Jigamaree) found he was faced by the problems of some boats using over-lapping headsails while others don’t, which contributes to the disparity of their IRC ratings. If the One Design movement in the class continues to gain traction, January’s AGM may well see a ruling in favour of everyone having the same overlaps, which will assuage the feelings of those bred in the highest One Design traditions. But equally if total standardisation is accepted over time, the movement towards sailing as a separate class will inevitably build, to the detriment of numbers in DBSC Class 1. For the J/109s, it’s arguably a problem of success, whatever effect it may have on cruiser racing on the bay. But with class numbers increasing in late summer, and rumours of further boats on the way, with the Nationals 2016 coming up the agenda the various issues were parked in August until the January AGM, and the class got itself into championship mode for the first weekend in October. For the Kellys from Rush, it was the perfect time of year, as their A Team were all available to race Storm. Far from struggling to keep down to the crew weight limits, they were below them. The racing was red-hot – several races saw the entire fleet across the finish line within three minutes – and at the end, Pat Kelly’s Storm rounded out a magnificent season to win the J/109 Nationals 2016 with 12 points to the 15 points each for Tim Goodbody’s White Mischief and Ronan Harris’s Jigamaree, both of the RIYC, with White Mischief taking second overall on the countback. Andrew Craig’s Chimaera was fourth on 17, John Hall’s Something Else was fifth on 20, and Paul Barrington’s Jalapeno was sixth with 28pts. And the tough racing was matched by a high level of sociability ashore, underlining the impression that the J/109 has at last become the happening class as a class, rather than as an important part of a cruiser division. Looking to current developments in the J/109 fleet, one of the most interesting has been the acquisition this week of Andrew Sarratt’s J/109 Jedi by the Rumball family’s Irish National Sailing School in Dun Laoghaire. Kenneth Rumball (who this weekends starts the Middle Sea Race, though in another boat) recorded this vid which gives an insight into a development which has exceptional opportunities for many aspects of Dublin Bay sailing, and should lead to a dynamic cross-fertilisation of talent and experience at every level. 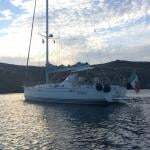 Among other possibilities, it will offer an ideal opportunity for a private test sail by a potential J/109 owner who might like to assess the boat without making his or her interest too public. 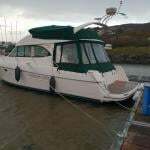 If you’re interested in joining, the word is that the second-hand market price range is €70,000 to €100,000, with the expectation of a very good boat at €90,000. Annual running costs in Dublin Bay will usually start with the marina fee of around €3,000, but expenditure thereafter can be very variable, depending largely on how high you aim in your choice of sails. If the AGM in January sees the main emphasis on the One Design route, there might even be – as there is with some other more traditional one design classes – a total standardisation of sails, with a reduction in costs, but somehow you don’t see that happening with a class filled with movers and shakers of this calibre. Either way, the Dublin Bay J/109 class association structure will surely see more development, a necessary move as it changes from being part of another class into a new growing unit with its own momentum. When you remember that all J/109s were exactly identical as they popped out of the mould, it may seem strange that the growing number of owners in the Greater Dublin area find themselves faced with tricky choices which will determine the health of the class well into the future. It is even possible to envisage a National Championship in which the fleet gets three sets of results from each race – the scratch result acknowledging the one design aspirations, the IRC result acknowledging the tiny differences between boats, and the Progressive ECHO result which will give encouragement to those who seldom reach a place on the podium. It will take the wisdom of Solomon and a generous spirit of give and take to hit on a set of formulae which will best suit the needs of the J/109 class in Dublin Bay. But in Dublin Bay of all places, with its noble tradition of acceptance of One Design constraints going back unbroken to 1887, it can surely be achieved.